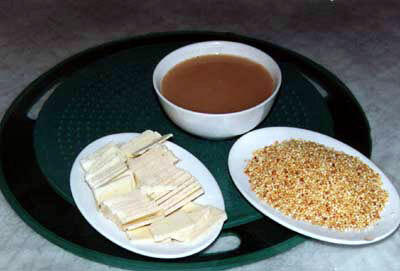 Milk curd is a common milk product in Mongolia herdsmen's homes. It tastes slightly sour or sweet with the strong scent of milk. The preparation of milk curd involves fermenting fresh milk and boiling it when it turns sour. Then press the water with gauze and mold it into the required shape. The best milk curd is milky white. Milk curd is tender and fine when eaten freshly or it can be dried for storage.